You could call Quatuor Machaut a work of transubstantiation.Through the album’s namesake group—the saxophone quartet of Biardeau, Simon Couratier, Francis Lecointe, and Gabriel Lemaire—Machaut’s medieval score is unfixed, its language morphed and broadened by centuries of musical progress. Still, the music is rooted in the harmony and budding counterpoint of that early period music, even as there’s something deeply postmodern in the spectral, psychedelic sound of four saxophones reverberating in the cavernous Abbaye de Noirlac. Liturgy aside, there’s no divorcing this music from the significance of that massive cathedral resonance, which nourished the bloom of polyphony in the Middle Ages. Much of the album features Biardeau’s own compositions, inspired by the Mass and fleshed out over three years of experimenting and improvising in different performance spaces. “Kyrie” floats from an ethereal opening to improvised soloing over a slow melodic line, finally settling into a gorgeous exposition of Machaut’s own movement. In tracks like this, Biardeau’s writing actually points back to a style older than even Machaut’s: a futuristic organum, his plainchant melodies adorned with an unbridled, improvised vox organalis, all in strange metal voices no medieval churchgoer could possibly imagine. But surely the overpowering, almost intoxicating feeling of the music is one they would recognize. Quatuor Machaut feels like a study in contrast: the microtonal torsion of “Gloria’s” beginning against the beautiful consonance of its later discant, or the raspy, growling baritone in “Solus” versus the pipe-organ purity of “Credo.” But what’s most remarkable is how strongly the very old and the very new ultimately cohere: a seemingly eternal continuity that runs through these young musicians, products of an atonal, indeterminate age, playing 600 year old music in the hushed night air of a cathedral that’s older still. Quatuor Machaut is significant music, unlike anything else in recent memory. A moment of silence marks the end of “Credo” before the quiet unison lines of “Ite, Missa Est” close the album. Around its warm notes, the outside world is heard for the first time in the immaculate recording, the faint drone of nighttime frogs and insects calling us back from the firmament, a summons by earthly things. Go forth, the Mass has ended. 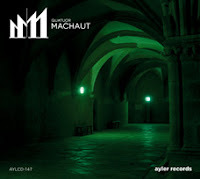 It's interesting to see how popular Guy de Machaut is with modern jazz musicans in the last few years: check also Samuel Blaser's album and Noël Akchoté's. Great album this one.